Natural hoof trimming is gaining in popularity. Many horse owners have discovered that their horses don’t need to where fixed metal horse shoes to have strong healthy hooves. In fact, nailing on horse shoes can lead to hoof problems, or make problems worse. 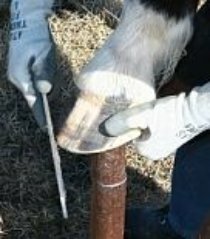 What is Natural Hoof Trimming? Often referred to as Barefoot Trimming, this style of hoof work is modeled after the wild horse hoof. Wild horse hooves are some of the strongest and healthiest, and obviously wild horses aren’t visited by the farrier every few weeks! By studying the shape and wear patterns on wild horses, many farriers and horse care providers developed a new way (that is ever evolving) of trimming horse hooves so that shoes were unnecessary. If your horse has traditionally worn shoes, there may be a bit of an adjustment period after taking the shoes off. Often your horse will be sore, not because of the natural hoof trim, but because of underlying hoof problems, that have been covered up by corrective shoes, or because the hoof just isn’t used to contacting the ground. 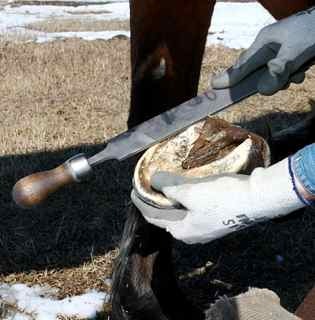 Natural hoof trimming methods may change the angle of your horse’s hoof, which will also mean that muscles need to adjust to the different, but ultimately more supportive shape of the hoof. If your horse does experience pain or lameness, you can help ease the transition period by using horse hoof boots alone, or combined with hoof pads for increased comfort. Usually this transition period will be quite short, so be sure to contact your natural hoof trimmer if you are concerned your horse isn’t adapting well. A key feature in the barefoot trim is the mustang roll. Using the hoof nippers and rasp, the lower portion of the hoof wall is angled and rounded, to simulate that wear patterns found wild mustang hooves. Feral horse herds cover large territories and diverse landscapes, shaping and naturally trimming their hooves of rocks and other hard ground. Domestic horses don’t often have the opportunity for as much movement...largely because their food comes to them...so need regular barefoot trimming to keep their hooves short and correctly shaped. Many domestic horses that are ridden on pasture, forest trails, and mainly soft ground will have no problems with barefoot riding. Once the hooves are correctly maintained through natural hoof care they should be strong enough to hit the trail. If you will be riding on very rough or rocky ground, and your horse lives and spends most of its time in a soft pasture, you may need the added protection of horse hoof boots during your rides. Horse hoof boots come in a wide variety of styles, and must be sized for your horse. It may be possible to use the same boots on more than one horse if their hooves are very close in size. What is wonderful about using hoof boots, is that unlike metal horse shoes, you only need to use them occasionally. If you are riding around home in the pasture or arena, there is no need to put them on!